First Look, Venture Bros. The Monarch Entertainment Earth Exclusive! 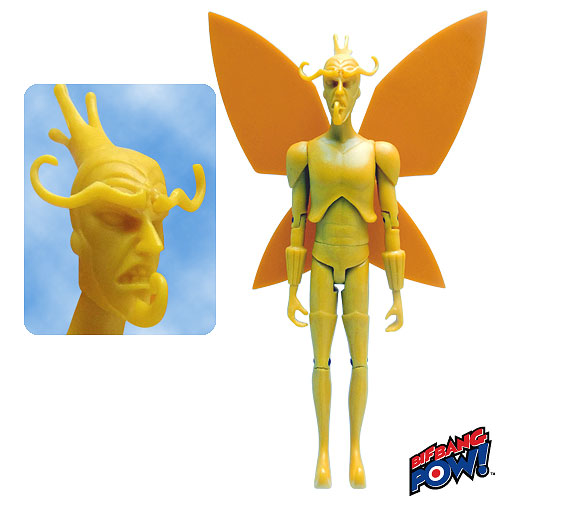 First Look at the limited Entertainment Earth Exclusive Venture Bros. The Monarch , 3-¾ Inch Unpainted Action Figure. There are only going to be 500 figures available. Ever look at your toys and wonder what they would look like with no paint on them? Well here you are! This exclusive action figure is based on those we used for our test shots! Basically, now that we know the molds are filling correctly and all the pieces fit together as they should, we wanted to make a totally AWESOME exclusive as a special bonus for fans! With no paint, you can examine the great detail and symmetry of this action figure! Get yours as a special preview before the release of the regular figure! This Monarch Exclusive is hot off the injection machine, in its original form, unpainted and blister packaged. Make this exclusive part of your collection! Here's a chance to get a unique specimen for your collection, before it goes through the paint masks which make up the finished product." Labels: action figures, Brock, Collectible, Dr. Girlfriend, Exclusive, The Monarch, The Venture Bros.